Fanny Brice isn’t exactly a role model for women’s liberation. As told in the musical Funny Girl by Isobel Lennart (book), Jule Styne (music) and Bob Merrill (lyrics), she nearly destroys her career and undermines her talent to stay with an emotionally abusive husband who can’t deal with the fact that his wife is more successful than he is. And as the show creaks along attempting to pass itself off as lighthearted musical comedy, you can’t help but wince at the hurtful ways people treat Fanny — people she loves and adores. It’s sad and a bit uncomfortable. But this is a musical theatre classic, after all, so we ignore these thorns and marvel at the talented cast, energetic production numbers and soaring ballads, all of which are well-represented in Drury Lane’s slick, efficient production. Oh, and there’s the Barbra Streisand factor. I gather, now having *finally* seen a professional production of Funny Girl onstage, the main reason this show is so rarely produced — and hasn’t been revived on Broadway since the original production closed in 1967 — isn’t JUST because the MASSIVE title role requires a blazing, engaging stage star. No, there’s a bigger issue here: the show’s book needs some major streamlining. Perhaps an overhaul. For example: There seems to be a whole chunk of information missing regarding Ms. Brice’s struggle to her first professional gig. It seems she goes from singing in the alley to starring in a flashy production number (“Cornet Man”) overnight. And the “girl” in question gets very little time to actually be funny. Most of the time, she’s trying to overcome the odds and plead for the love and attention from others. It’s more tragic than anything. “Tragic Girl,” if you will. So, she was a “Sadie, Sadie, married lady” years before Mr. Nicky Anstein, of the frilly shirts and top hats, waltzed in. The Drury Lane production is really quite good; the show is just a bit of a drag. As Fanny, Sara Shepard is a real find. She’s game and winning and immediately likeable. She does well on her two big numbers — particularly “Don’t Rain on My Parade.” That’s one long final note, and she nails it. Tears of desperation well up in her eyes during “I’m the Greatest Star.” And she’s only going to get better, I bet. As her suitor, Paul Anthony Stewart is fine as Arnstein. Attractive, charming, a fine voice. But it’s a thankless role. In other supporting roles, Catherine Smitko attempts to insert some zest as Fanny’s mother, but she comes off as one-dimensional, thanks to the material. The sweet Jameson Cooper plays Fanny’s guy pal, Eddie. But not much is done to flesh him out. It’s a stock character, really. Director William Osetek adds some nice psychological layers — most notably in the number “Sadie, Sadie.” While the cast rejoices in the glories of married life for a stay-at-home wife, Fanny wanders back to her dressing room, which is permanently fixated stage right, as the color drains from her face. Fanny’s a born performer. “Staying at home and becoming a slob” aren’t part of her genetic code. And the sets, costumes, lights and music direction are all very admirable — you certainly get more than your $35 worth, that’s for sure. The show, however, needs work. But that’s not Drury Lane’s fault — they’ve done a great job, given what they have to work with. 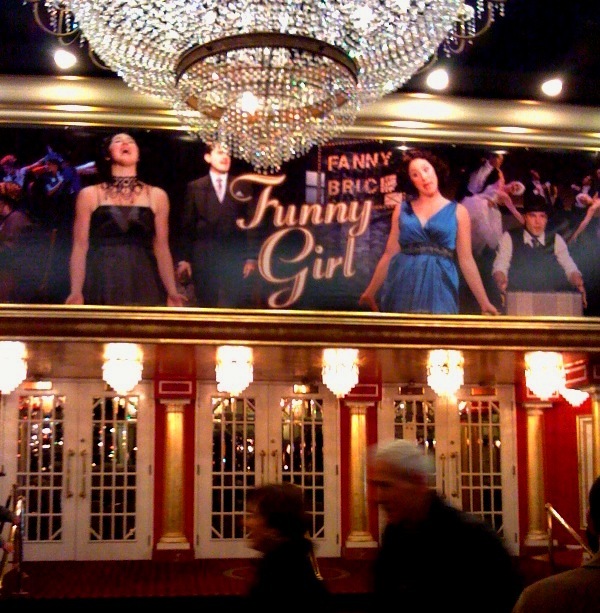 Funny Girl plays through March 7, 2010 at the Drury Lane Oakbrook Terrace. Go here for more information. Previous Post It’s Friday. Time for a finale!